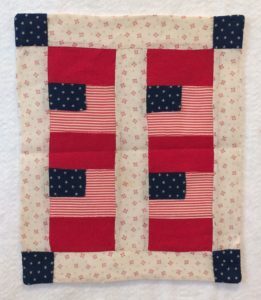 I know the 4th of July is over but I leave Patriotic Quilts all over my house until the end of August when I switch them out for fall quilts so I just couldn’t resist sharing some of the little ones with you. 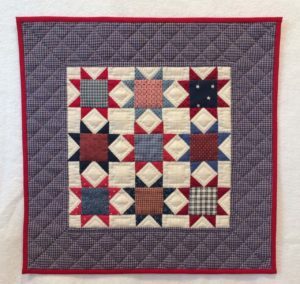 This first one was a great E-Bay find because it is all hand quilted. I love the scrappy look of stars in different reds and blues. This next one is so precious. 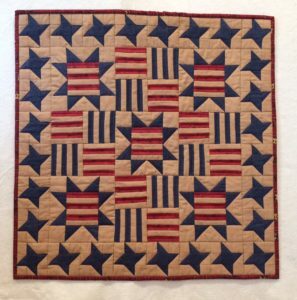 It is only 9” x 10.5” and has no quilting but it celebrates our country’s birthday anyway. The blue fabric has little white stars and the red/white fabric is striped so it didn’t require much piecing but isn’t it wonderful? As you can see I even swap out some of the doll bed quilts. 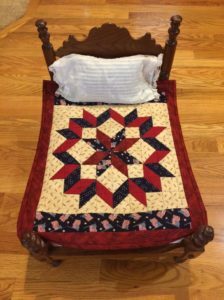 A Carpenter’s Star block is one of my favorites since my dad loved to do carpentry almost as much as I love to do quilting. I made this one to celebrate his passion as well as his patriotism. I made this little trio of quilts to hang together and make a larger flag. Sometimes it hangs on the wall but this year I have just laid it out on the coffee table. Each little quilt is only 6.5” x 9.25” so it doesn’t take up too much room but gives a nice splash of color. This last quilt is a bit larger (24” x 24”) but I still put it in my “Little Quilts” category. I made the pattern for it last year and even though I love traditional red, white and blue I also appreciate red, tan and blue. What can be better than stars and stripes? Perhaps you can find a Veteran today and thank him/her for their service.